Off the road from Jaffna to Karainagar, in the sleepy village of Moolai, stands a distinctive cream-coloured edifice that the World Health Organisation says is the first non-profit co-operative hospital in all of Southeast Asia. 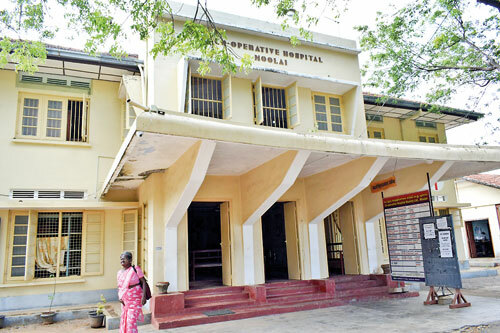 In its heyday, the Co-operative Hospital Moolai was bustling. Today, it is far quieter. With many patients choosing to go to the Karainagar Divisional Hospital across the causeway, this institution now caters to about 65 outpatients a day while around two or three are in its wards on ordinary days. The hospital has a cardiology, dental, emergency and x-ray unit, among a few others. It is open 24 hours. Specialist doctors are chauffeured the 15km from Jaffna in one of its two ambulances (one is now out of service) offer channel service here for a cheaper fee. Yet, there are many empty buildings. Its nursing school is a desolate shell; squirrels have built nests in the holes mortar shells have left in its walls. Some areas of the premises are overgrown with weeds. At the back is a basic home for the aged. The hospital charges Rs.32,000 a month for a room, meals and personal attendant for each of its inmates. One septuagenarian said she had six children in all parts of the world (she couldn’t remember the countries) who had fled in their young days to escape Tamil Tiger recruitment. The hospital harks back to a time when co-operatives were a vibrant reality across the northern peninsula. In 1935, a group of residents got together and opened up a dispensary to provide treatment at a cheaper rate. It was registered under the Co-operative Ordinance in 1936 and grew into a 105-bed hospital with an operation theatre (it does only minor surgeries now because it no longer has a blood bank). The institution is justifiably proud of its origins. It created co-operative history in the sphere of health services, boasts its promotional literature. Co-operative eradication of illness was a unique and new idea at the time. And Moolai inspired the establishment of similar hospitals in Matara, Bandarawela, Sandalankawa, Tellippalai and elsewhere. Its guestbook – the first entry is in 1955 – has notes from foreigners, much of it in spidery writing, who visited from all parts of the globe to study the experience of the Moolai Co-operative Hospital. Today, substantial financial input is needed to raise it to its former glory. Members have fallen away. Of 4,000 people registered with the co-operative, only 150 are active, fee-paying participants. 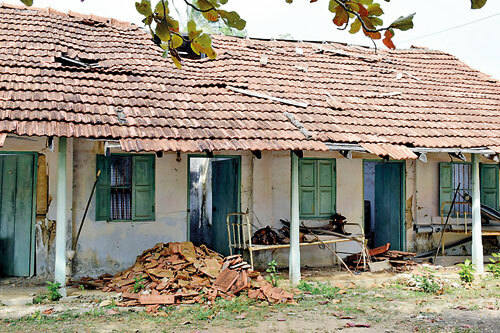 A renovation of sorts is to take place with assistance from the Tamil diaspora in Britain. But the hospital needs more, including an acceptance by the State that much of the damage to its infrastructure and services was caused by war. Like other co-operative bodies in all parts of the North, this institution was left gasping after the conflict and has not been compensated for its losses. Co-operative services and infrastructure – this includes bakeries, handlooms, mills, stores – throughout the province tell a similar story. The principle of co-operatives is simple. As formally defined, it is an organisation owned by its members who use its services like consumer co-operatives or credit unions; or by people who work there (a worker co-op); or by those who live there (a housing co-operative). It is a classic form of participatory development in which people are stakeholders. The North has a rich tradition of people-owned production and shops run by co-operatives. In Jaffna, there are 24 multipurpose co-operative societies (MPCS). The number in the Northern Province is nearly 50. While many of them have taken a hit and are struggling after the war, the Pandateruppu MPCS in the Jaffna peninsula has held its nose above the water. It has 3,000 active members and still runs a rice mill, grinding mill, bank, petrol shed, bakery, gingelly oil press, co-op city and textile shop among others. It also has 17 co-operative shops in neighbouring villages. These sell products at lower prices than private sector retail outlets, thus acting as price stabilisers. The co-operatives also sell at reasonable prices because they keep lower profit margins. The objective, after all, is service towards the communities from which its members are drawn. Even outlets that are not doing well are sustained in order to enable uninterrupted supply to the public. The Pandateruppu MPCS once also had a match factory, dyeing factory, power looms and soap factory. It had many more vehicles. Good management and decades of accumulated profits went into building and acquiring these facilities. All were swept away in the war. The North did not have just consumer co-operatives. There were also producer and industrial co-ops. Some of them are still quite strong, such as the fisheries and palm development co-operative societies that promote palmyrah. They are also organised and industrious. What these bodies need now is a cash injection – working capital, the official said. This could come by way of low interest loans and grants. It will help the societies revive their activities and industries, such as the rice mill in Pandateruppu that needs upgrading. It is because of the strength of co-operatives in the North that they survived the war. Some economists now believe they have a role in addressing the crisis in the rural economy, including unemployment. The private sector won’t do it and the State can’t. A structure within which people come together and produce in their best interest might be the fastest, most effective way out. And it won’t take much to get it restarted.